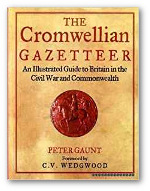 In 1987 the Cromwell Association and Alan Sutton jointly published The Cromwellian Gazetteer: an illustrated guide to Britain in the Civil War and Commonwealth by Peter Gaunt. It was a commission by the Association to mark our own 50th anniversary and designed as a guide to sites connected with the Parliamentary cause during the Civil War and Interregnum 1642-1660, giving particular prominence to those places linked to Cromwell. With the kind permission of the author and copyright holders the Association now makes the entire text of the Gazetteer available on-line. To make it as user-friendly as possible it has been broken down into six sections. Consideration was given to attempting to plot all the sites on an interactive map but the density of entries would mean that it would be unusable on anything other than a large screen desk-top pc. Hopefully by presenting the text as it is the information should be viewable on a smaller device. The Gazetteer is arranged alphabetically by County – that is counties as they were in 1987. This disregards historic divisions swept away in the major reorganisation of 1974, and overlooks those changes made since. So for example entries for Worcestershire are to be found under Hereford and Worcester, Yorkshire appears as North, West and South Yorkshire and the old East Riding under Humberside, which includes parts of North Lincolnshire. While this may have the scope to be frustrating at times (and cause you to muse on the idiosyncrasies of local government) hopefully with use you will acquire familiarity with the layout. Use of the Search Tool in Adobe Reader will assist. In addition to the geographic entries the Gazetteer has an introductory essay outlining the scope of the work and its methodology, supported at the end by maps plotting Cromwell’s itinerary and two genealogical tables, as well as an index of select names. This is presented here as one section. 1. Introduction, itineraries and genealogy.